Prague’s oldest bridge was built to replace the Judith Bridge that had been badly damaged by floods in 1342. The Stone, or Prague, Bridge, called Charles Bridge since 1870, was begun in 1357 by Charles IV and was completed in 1402. The bridge is built of sandstone blocks, flanked at each end by fortified towers (Lesser Town Bridge Towers, Old Town Bridge Tower). From 1683 to 1928, 30 statues of saints were carved to decorate the bridge, the most famous of which is the statue of St John of Nepomuk. (the title Charles Bridge only became popular around 1870 based on an earlier suggestion of K. H. Borovský) is the oldest preserved Prague bridge. 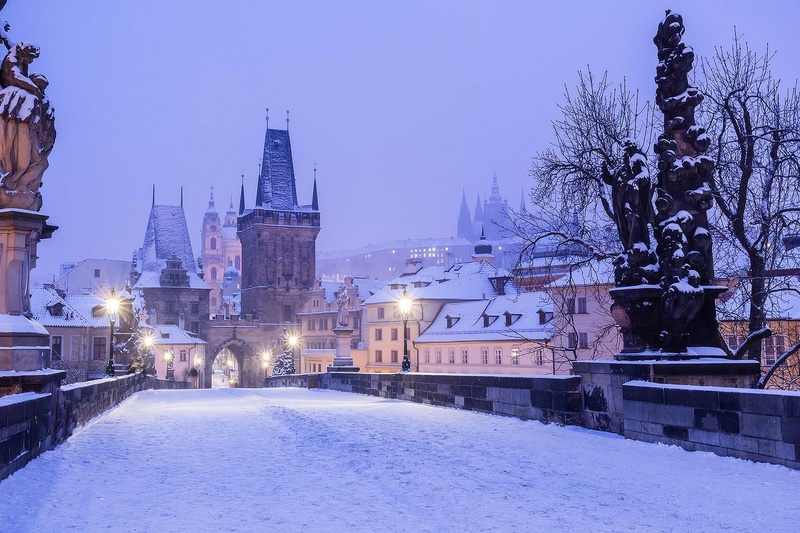 There are more similarly magical connections relating to Charles Bridge. Petr Parléř was appointed to manage to construction, yet the bridge was only completed after his death in the beginning of the 15th century; it is made of sand-stone blocks, 515.76 m long, 9.5 m wide (it was one of the mightiest bridge constructions of its time), it rests on 16 vaults of different span reaching from 16.62 to 23.38 metres. It was damaged by floods several times, e.g. in the years 1432 (5 pillars destroyed), 1784, and namely in 1890, when the wood deposits from Vltava’s upper stream demolished 2 pillars and 3 vaults. In 1723, the bridge was lighted via oil lanterns. The staircase to Kampa was built in 1844 in place of old stairs from 1785. Trite sidewalks on the sides of the bridge were in 1833 replaced by sidewalks of iron ranges, furnished with anti-slipping notches. From 1883, there was a horse tram passing across the bridge, replaced in 1905 by electrical line. In order to preserve the artistic view of the bridge and not to ruin it by wires leading at the top, Frantisek Křižík came with a special line through the bridge deck. Yet the heavy carriages vibrated the construction, and thus were replaced by buses in 1908. Even the buses were not ideal, so the transport was again stopped the next year, to be renewed in 1932 using buses on tires. Public transport operated here until the World War II, cars stopped driving across the bridge in 1965. 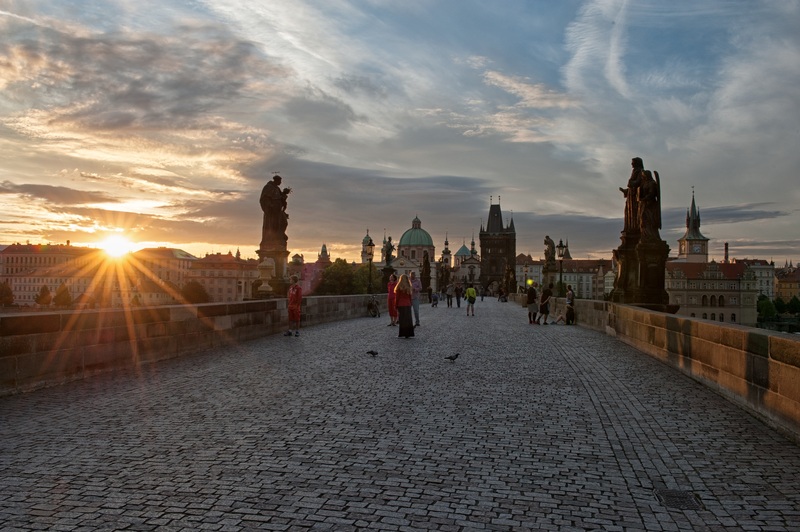 Just like the bridge itself, also the tower was built by the Parléř’s smelting plant; the lower part came into existence when Charles IV was still alive, which means the sitting statue being a part of the decoration, is the real resemblance of the emperor. The second sitting figure represents Václav IV, and between them, there is St. Vitus - the bridge’s patron. In the upper part, which represents the heavenly sphere, there is St. Prokop and St. Sigismund. Rich sculptural decoration was originally also on the side facing Malá Strana, but it was destroyed when the Swedes unsuccessfully besieged the bridge in 1648 (to be commemorated by an inscription on a memorial plaque by B. Spinetti). More fighting took place here in 1420, when the Hussites passed through towards Malá Strana, and the last fights took place in the revolutionary year 1848. In 1621, baskets with the heads of 12 noblemen decapitated at Old Town Square (Staroměstské náměstí) were hung here as a warning (more details in a separate document). The smaller tower formed a part of Judith’s Bridge. Today’s resemblance is Renaissance from 1591, when it was re-built and lowered after a fire. The larger tower was built in place of its older predecessor in the second half of the 15th century during the reign of Jiří of Poděbrady. The inter-tower gate was built in the beginning of the 15th century. There are 30 sculptures and sculptural groups placed on the balustrade, most of them from the period 1706 - 14. The first cross was placed here in the 14th century; the statue of Bruncvík was completed before 1503, with only a pedestal preserved, placed today in the National Museum’s Lapidary. There is a copy made by Ludvík Šimek in place of the original statue, and the same author has also created the knight’s figure. St. John of Nepomuk is the oldest still standing statue in the original form, dating back to 1683; the last sculpture placed was the sculptural group of St. Cyril and Methodius in 1928. Sculptures and sculptural groups, which were later destroyed by floods, or damaged by weather and restored, were replaced by copies made by contemporary artists, and the originals were placed into the National Museum’s Lapidary, for example, or to Gorlice at Vyšehrad. Most sculptures were made of sandstone, St. Philip Benitius is made of marble, and St. Cross (Calvary) and John of Nepomuk are made of bronze. St. Ivo - made by Matyáš Bernard Braun upon the order of the Faculty of Law (1711); on the bridge, there is a copy made in 1908 by Frantisek Hergesel jr.; the original is stored in the National Museum’s Lapidary. St. Ivo is the patron of lawyers; a widow with children looks up to a saint who took up their defence against court. To his right, there is Justice with a sword and blindfolded. St. Barbara, Margaret and Elisabeth - made by Jan Brokoff with a great contribution of his son Ferdinand Maxmilián (1707). Barbara is in the middle of the sculptural group, Margaret is on the right, and Elisabeth is on the left. The sculpture of “holy virgins” was realized at the expense of the imperial council Jan Václav Obytecký of Obytec (St. Barbara was supposed to protect him against sudden death). His emblem is on the pedestal below Margaret, his wife’s emblem is under Elisabeth. A copy of the piece is placed on the bridge. Pieta (Bewailing of Christ) - made by Emanuel Max (1859); classic depiction - Jesus resting on his mother’s lap, Mary Magdalene is on his right, St. John in the middle. The sculptural group was ordered by the Prague community for money collected in a public gathering. Calvary was here in the 15th century; Jan Brokoff’s Pieta was here from 1965 on, damaged by shooting in 1848 and moved to the yard of the Pod Petřínem Hospital in 1859. St. Joseph with baby Jesus - made by Josef Max (1854); originally, there was a statue with the same theme from 1706 on made by Jan Brokoff, but it was damaged by shooting, just like the neighbouring Pieta, and placed to the National Museum’s Lapidary. Max’s statue was ordered by a wholesaler Josef Bergmann. St. Francis Xaverius - made by Ferdinand Maxmilián Brokoff (1711); this sculpture is often considered to be Brokoff’s most valuable piece of work on the bridge, although he created it when he was only 23 years old. We can see what he looked like back then, because he portrayed himself in the appearance of the young man standing under the saint’s hand with a cross. The lower part of the sculpture is formed by figures from exotic countries where Francis worked as a missionary - a Chinese, a Tatar, a blackamoor, and an Indian, carrying a desk with standing St. Francis. In front of him, there is a pagan prince kneeling, ready to be baptised. This sculpture, similarly to the originally opposite one, just as monumental group of Ignatius of Loyola by the same author, fell in water during the 1890 flood. In 1913 a copy was settled in the same place, made by Čeněk Vosmík, with the original being placed in the National Museum’s Lapidary, just like the remains of the St. Ignatius sculpture. Both saints were significant Jesuits; St. Ignatius established this order. St. Christopher - made by Emanuel Max (1857); originally, there was a watch-house in this place, which collapsed into water during the 1784 flood, even with the guards. Strong Christopher came from Canaan. He served God by carrying pilgrims on his shoulders across a wild stream. Once he even carried Christ himself this way, when he took on a resemblance of a small child - this view is depicted by the sculpture (the name Christophoros means “the one who carries Christ” in Greek). St. Christopher is the patron of travellers, sailors, seafarers, protector against storms and water. St. Francis Borgia - made by Ferdinand Maxmilián Brokoff (1710); the central figure of the third general of the Jesuit order coming from a famous Catalan family of Borgia is completed by two asymmetrically places angels on the sides, carrying pictures of Madonna and the sacraments. The saint’s attributes are in the lower part of the pedestal: helmet (he used to be a soldier), crown (before he became a priest, he was the vice-roy of Valencia), and a scarlet hat. The upper part of the pedestal holds the emblem of the burgrave Franz of Collet. St. Ludmila with little Vaclav - made by Matyáš Bernard Braun (after 1720); in this place, there was originally a statue of St. Václav as the winner between two angels by Ottavio Mosto from 1695 - 1701, which collapsed into the Vltava river during the 1784 flood. It was replaced by Braun’s sculpture, which was originally placed on the castle’s ramp. St. Ludmila is carrying a veil in her left hand, with which she was strangled, and with her right hand, she is pointing at a Bible in which little Václav is learning to read. Václav’s death is depicted on the pedestal’s relief. A fragment of Mosto’s sculpture is placed in the National Museum’s Lapidary, some of its parts were elevated from the Vltava bed, so far the last one in 2004. Also the original of St. Ludmila was moved into Gorlice at Vyšehrad, there is a copy made in 1999 by J. Kačer and M. Kačerová. St. Francis of Seraphim - made by Emanuel Max (1855); in this place, there was also an originally Baroque statue of a saint made by František Preiss, which today is placed in front of the Capuchin church of St. Joseph at the Náměstí republiky Square. Today’s sculptural group was made at the expense of count František Kolowrat - Leibstein to commemorate emperor Franz Joseph I saved in an assassination attempt in 1853. St. Francis established the begging order of Franciscans, and he was also at the start of building the Christmas cribs (first done at Christmas in 1233). The sculpture depicts him wearing typical friar clothes between two angels - Seraphins. St. Vincent of Ferrer and St. Prokop - made by Ferdinand Maxmilián Brokoff (1712); a Dominican friar Vincent, a member of a rich Valencia family of Ferrer, is bringing a dead man in a coffin back to life, and with his raised arm he is exorcising devil from an obsessed person. Prokop, Czech patron, founder and abbot of the Sázava Monastery, is shoving a devil away with his crutch. There are three caryatids on the pedestal - a bust of a Saracen and a Jew, turned to Christianity by St. Vincent, and a crying demon chained by St. Prokop. The reliefs depict the Last Judgement and St. Prokop’s ploughing with the devil. According to the Vatican books, both these saints supposedly redeemed 100 000 of sinners, brought thousands of Saracens and Jews to Christianity, and tamed lots of devils. Bruncvík - outside the line of statues on a pedestal in the water, there is a statue below the sculptural group of St Vincent of Ferrer and St. Prokop, and it is a statue of a knight with drawn golden sword in his right hand, with a coat of arms on his side and with a lion by his feet. It was sculpted after a fragment of the original statue of Knight Roland from the 15th century, in a combination with a peculiar notion of the sculptor Ludvík Šimek (1884). The statue, which symbolized municipal authorities, was substantially damaged at the end of the Thirty Years’ War with the Swedes on Charles Bridge. Its authentic torso and preserved original pedestal are today deposited in the National Museum’s Lapidary in the Exhibition grounds. The Old Bohemian legend of Bruncvík says he set out to foreign countries to win the right to improve his coat of arms with an image of a lion, instead of the present black eagle. He really encountered a lion during his travelling, and he managed to save it from a nine-headed dragon - and from that day on, the lion accompanied him faithfully. Bruncvík owned a magical sword, which according to the legend decapitated the enemies alone upon Bruncvík’s wish. When he returned home, he buried the sword on Charles Bridge - it is there for St. Václav to pick it up in place where his horse smashes the ground with his hoof on his way to help the Bohemian land. The sword will destroy the enemies and Bohemia shall live in peace for ever after. When Charles Bridge was repaired after the flood in 1890, a real large rusted sword was supposedly discovered in the bridge floor. St. Nicholas of Tolentino (Mikuláš Tolentinský) - sculpted by Jeroným Kohl (some resources name his son Jan Bedřich as the author) (1708); a saint who lived at the turn of the 13th and 14th centuries and became renowned for his miracles and healing of the sick. When he was 18, he entered the Augustinian order and worked in the Italian town of Tolentino. The statue depicting the saint as he offers bread to the poor was made upon the order of the St. Thomas Augustinians. On the bridge, it is a copy by Jan Jiřikovský from 1969. The original is deposited in Gorlice at Vyšehrad. St. Luthgard or The Dream of St. Luthgard - sculpted by Matyáš Bernard Braun (1710); it is the first known piece from this sculptor and one of the highest artistic quality on Charles Bridge. The sandstone sculptural group, which might have been inspired by Bernini’s Ecstasy of St. Theresa, was paid for by Evžen Tyttl, the abbot of the Cistercian monastery in Plasy. The original is deposited in the National Museum’s Lapidary in the Exhibition grounds. The copy was made by J. Novák and B. Rak in 1995. Luthgard lived at the turn of the 12th and the 13th centuries in today’s Belgium, she was a member of the Cisterciac order; she became a nun on the basis of Epiphany of Jesus, who called her to follow him. She was blind the last 12 years of her life, and before she died, she had a vision of Christ on the crucifix as he hugged her and pressed her lips on the wound on his hip. This event is depicted in Braun’s sculptural group. St. Adalbert/Vojtěch - sculpted by Michal Jan Josef Brokoff - an older brother of Fedinand Maxmilián, who probably cooperated (1709); the statue in richly pleated coat is standing on a pedestal with angels and the emblem of an Old-Town alderman - the donor Markus Joanelli. The original is deposited in Gorlice at Vyšehrad, the copy was made by Vojtěch and Karel Hořínek and has been on the bridge since 1973. Vojtěch of Slavník was the second Prague bishop, and he also had merit in establishing a Benedictine monastery in Břevnov. He survived the extermination of his family by the family of Vršovec thanks to being in Rome at that time. When he returned, he decided to work as a missionary among the Baltic Prussians in Pomerania, where he died as a martyr in 997. He is a saint worshipped throughout Central Europe. St. John of Matha, Felix of Valois and Ivan - sculpted by Ferdinand Maxmilián Brokoff (1714); this monumental sculptural group was made upon the order of count František Josef Thun on behalf of the Trinitarian order, established in the 12th century by St. John and Felix with an effort to redeem Christians from pagan captivity. There is St. John standing on a rock with broken handcuffs, St. Felix next to him, and hermit Ivan a little below, as the representative of the country patrons. There is a cave with bars in the lower part of the rock with imprisoned Christians, guarded by a dog and a Turk with a scourge and a sabre. Behind the Turk, there is a deer with a cross in between his horns to remind the time when both the founders of the order lived in forests as hermits and were disturbed in their contemplation by an apparition of a deer with a blue-red cross on his head. St. Václav - sculpted by Josef Kamil Böhm (1859); the statue was paid for by Pavel Alois Klár, the son of the founder of Klár’s Institute for blind people, to celebrate the institution’s 25th anniversary. Madonna and St. Bernard - made by Matěj Václav Jäckel (1709); this sculptural group was made upon the order of abbot Benedikt Littwerig from the Cisterciac monastery in Osek. In the middle, there is Virgin Mary with baby Jesus, looking up to her on the right there is St. Bernard kneeling in friar clothes, the little angel in front of him is holding the abbots’ hat. On the left, apart from the angels, there are attributes of Christ’s suffering - crucifix, nails, hammer and tongs, figure of a rooster and veraicon - a reminder of the legend of Veronique, who offers the suffering Christ a scarf to wipe his face, and the face miraculously imprints on the scarf. The original sculptural group is placed in Gorlice at Vyšehrad. The copy was set on the bridge in 1978 - 9 and the authors are M. Vajchr, V. Hlavatý, J. and P. Vitvar, M. Tomšej, A. Viškovská-Altmanová and J. Wolf. St. Bernard was a religious thinker of the 12th century, a significant representative of the Cisterciac order, and its reformer. For all his life, he was a big admirer of Virgin Mary - he wrote a poem Salve Regina (Hail Queen), which Dante praised by saying that angels in heaven sing it. Bearded man - this is one of our oldest public sculptures. Originally, it was placed on the third vault of Judith’s Bridge on the Old Town’s side, but when vaulting the branch, it was taken out and bricked into the embankment wall between Charles Bridge and the Křížovnický Monastery, on the same level. The sculpture of the bearded man was Old Bohemian first water mark. It was known where the water would hit the town if it rises to the level of the beard, the nose, or the ears. Madonna, St. Dominic and St. Thomas Aquinas - sculpted by Matěj Václav Jäckel (1708); both the saints, founders of the Dominican order, accept a rosary from Madonna. Below Madonna, there is the Earth in clouds and a symbolic dog with a torch in his mouth (Domini canes = dogs of the Lord). The original statue was made upon the order of the Dominicans of St. Jiljí and is deposited in the National Museum Lapidary in the Exhibition ground; the copy on the bridge was made by V. Bartůněk and S. Hanzl in 1958 - 61. St. Thomas Aquinas was one of the greatest medieval thinkers and the founder of scholastics. Calvary, Holy Crucifix - the crucifix used to be in this place ever since the time of Charles IV as the first decoration on the bridge, and it has been replaced several times since then. The sandstone sculptures of Virgin Mary and St. John were made by Emanuel Max in 1861; the current bronze, gold-plated crucifix was cast in Dresden in 1629 by H. Hillger, and it was purchased in 1657 for Prague with a contribution of Karel Škréta. The strongly gold-plated inscription in Hebrew “Holy, holy, holy is the God of the crowds” (Kadosh, Kadosh, Kadosh, Adoshem Cevaot) located around the crucifix was paid for by the royal tribunal in 1696, according to the inscription on the pedestal, using a penalty of a Jew who scorned the crucifix. However, the legend is false; the convict was a victim of untrue denouncement. For the Jewish citizens and city visitors, this inscription is incomprehensible and it offences their religious belief; therefore there are three plates now, positioned on the 8th March 2000, with an explanatory note, and their author is sculptor Vlastislav Housa. St. Anna - sculpted by Matěj Václav Jäckel (1707); the saint is depicted in the contemporary popular representation accompanied by her daughter Virgin Mary and her grandson Jesus, who hugs the Earth with a crucifix, and Anne holds him in her arms. In her second arm, she is holding Virgin Mary, who looks up to her and offers her a bouquet of roses. The sculpture was paid for by count Rudolf of Lisov, the chamberlain and marshal of the Old Town; the original is deposited in Gorlice at Vyšehrad; the copy made by Vojtěch Adamec and Martin Pokorný was placed on the bridge in 1999. St. Cyril and Methodius - sculpted by prof. Karel Dvořák (1928 - 38); the sculptural group is located in place of Brokoff’s sculpture of Ignatius of Loyola, which collapsed into the river during the 1890 flood (today, the set up fragments are exhibited in the Lapidary in the Exhibition ground); the sculptural group expresses the missionary activities of the saints and the idea of Slavic unity. The author realized the fact that his sculpture would be compared with pieces of high Baroque, and the work therefore took a long time to complete. However, he managed to create a piece of art which is modern and yet it respects the neighbouring sculptures. The sculpture was ordered by the Ministry of Education to celebrate the republic’s 10th anniversary, and it was set in 1938. St. John the Baptist - sculpted by Josef Max (1855); the statue was ordered by J. N. Gemerich of Neuberg to replace Jan Brokoff’s Baptism of Christ from 1706, which was damaged during the 1848 revolution (today deposited in the Lapidary). John the Baptist, the patron of the Johanites - Maltese knights, has a crucifix and a shell on his left hip to commemorate Christ’s baptism. With its stiff immobility, this statue diversifies itself from the dynamic Baroque sculptures. This Romantic movement from the first half of the 19th century (Nazarenism) stressed sentiment and smooth lines, which were supposed to increase the appeal of the religious motives. St. Norbert, Václav and Sigismund - sculpted by Josef Max (1853); in this place, there was originally a sculpture with St. Norbert (the founder of the Premonstrate order) from the Brokoff’s workshop from 1708, which was replaced due to damage in Prussian firing in 1764 by the sculpture of St. Norbert with angels made by Ignác František Platzer. Both these sculptures disappeared, their appearance is only known from contemporary engravings. The current sculpture on a New-Gothic pedestal was ordered by dr. J. Zeidler, the abbot of the Strahov monastery. St. Norbert founded the Premonstrate order in the 12th century; his remains were taken to Prague in 1627 thanks to the Strahov abbot Kaspar Questenberk to be deposited in the Church of Virgin Mary’s Assumption at Strahov. St. John of Nepomuk - sculpted by Jan Brokoff (1683); the oldest sculpture on the bridge. The wooden model (today deposited in St. John’s church at Skalka) was carved by Jan Brokoff based on a clay sketch by a Vienna sculptor Matthias Rauchmüller; he supposedly turned from Lutheran to Catholic religion during the work. The design based on the wooden model was made by arch. Jean Baptiste Mathey, and baron M. B. Wunschwitz had it cast from bronze by a Nuremberg bell-founder J. W. Heroldt. This statue of St. John of Nepomuk became a binding iconographic model according to which other statues of this saint were and are made here as well as abroad. Five stars around the saint’s head, a surplice, crucifix and martyr’s palm form the inseparable attributes. The stars supposedly appeared above the water when St. John of Nepomuk was thrown down to the river. They should symbolize 5 letters of the Latin word “tacet”, which means “silent”. On the left relief, there is queen Sophia’s confession, and the throwing of Nepomuk into the Vltava river is depicted on the right relief. In the middle, there is an inscription and a bronze emblem of the donor. The statue is 2.5 m high, weighs 20 q, and its price was 7000 golden pieces. The statue was dedicated in 1683 to commemorate the three-hundredth anniversary of St. John of Nepomuk’s death, yet the donor miscalculated the event, because St. John was drowned in 1393. John of Nepomuk was very popular with poor people; the Jesuits used him to suppress the memory of Jan Hus and Žižka. On the balustrade, in the place where the saint was thrown to the river (between the statue of John the Baptist and the sculptural group of the Bohemian patrons), there is a small double archbishop’s brass cross on a marble plate, again with five stars. If you lay your hand on the cross in such a way as to have each finger touching one of the stars, then your secret wish should come true. The statue of John of Nepomuk is placed on a three-piece pedestal in which there are three bronze cast plates: the first represents queen Sophia’s confession, the right plate depicts the throwing of the saint in the Vltava river, and the middle inscribed plate states the Latin name of the donor of the statue. The relief on the statue of St. John of Nepomuk is also touched by people for the sake of good luck. John of Nepomuk was the general vicar of Prague’s archbishop John of Jenštejn. Upon the order of king Václav IV he was tortured to death in 1393, as he refused to subordinate religious right to the will of the secular ruler, and he refused to reveal the confession secret of queen Sophia. St. Anthony of Padua - sculpted by Jan Oldřich Mayer (1707); a sandstone sculpture of the preacher in the clothes of Franciscan friars with baby Jesus and a lily; at the saint’s legs, there used to be a decorative wrought lantern. The sculpture was paid for by Kryštof Mořic Witthauer, the council of the supreme burgrave office at Prague Castle. St. Anthony of Padua was a member of the Franciscan order and came from Portugal. He was unusually gifted as a preacher, a very good speaker. He spent a large portion of his life in Assisi, and he died in Padua in 1231, where later a temple was built above his grave. St. Jude Thaddeus - sculpted by Jan Oldřich Mayer (1708); a saint - one of Christ’s apostles, holding the gospel and a club with which the pagans killed him. The sculpture was ordered by František Sezima, the knight Mitrovský. St. Augustine - sculpted by Jeroným Kohl; sometimes his step-son Jan Bedřich is named as the author (1708); the saint is holding a burning heart and treads heretical books under his feet. There is the emblem of the donors - the Augustinians on the pedestal. The original statue is now deposited in Gorlice at Vyšehrad; the copy on the bridge was sculpted by J. Dušek, O. Velínský, A. Sopr and J. Hampl in 1971. St. Augustine was born in 354 in what is today Algeria, he was a quick learner from the young age, but he also liked to have fun. He only turned to Christianity under the influence of bishop Ambrose and his flaming sermons; he was elected for a bishop himself in 396. He wrote the rules for the friars’ life, from which many other religious orders stemmed later on. St. Cajetan - sculpted by Ferdinand Maxmilián Brokoff (1709); St. Cajetan with typical Baroque decorations of angels and clouds, there is a high triangle behind the sculpture, symbolizing the Holy Trinity. The sculpture was paid for by the former convent of Cajetans (Theatins) in Prague. St. Cajetan founded this order in the 16th century to help people during plague epidemies. St. Philip Benitius - sculpted by Michal Bernard Mandel (1714); the only marble statue on Charles Bridge was made in Salzburg based on an order of the Servite order, the member of which was also the author. A complete work was placed on the bridge. St. Philip was such a fiery preacher that he was appointed the order’s general vicar; he was supposed to become a pope, yet he refused this function (to be commemorated by the papal tiara behind his right leg). In his left hand, he is holding a crucifix, a flower sprig, and a book. In 2000, the restoration of the statue was completed. The restorer Jiří Diviš created a brand new pedestal from 4 pieces of Božanov sandstone (weight: 3.5 t, height: 1.8 m). The restorers Michal Tomše and Jiří Kaifosz restored the statue at the expense of the Liechtenstein family. St. Vitus - sculpted by Ferdinand Maxmilián Brokoff (1714); the sculpture was paid for by the dean of Vyšehrad Matěj Vojtěch of Löwenmacht. St. Vitus dressed as a Roman legionary (he came from Sicilly, he lived in the 3rd century) is standing on a rock with lions to which he was thrown to be killed. However, instead of killing him, they quietly lay at his feet. Before that, he was dunk in a hot pitch cauldron, but he got out without a single injury. Finally, he was tortured in prison until he died. St. Vitus is the patron of Bohemia, and he is also the patron of epilepsia patients, of dancers, actors and comedians; prince Václav was given the saint's shoulder arm from Emperor Henry, and he had a temple built and dedicated it to this saint. St. Cosmas a Damian with Salvatore - sculpted by Jan Oldřich Mayer (1709); the sculptural group was made upon the order of the Medical faculty (St. Cosmas and Damian are patrons of doctors), both saints are dressed in contemporary clothes of Prague University professors, they are holding containers with drugs and martyr palms. In the middle, there is Christ - the world’s redeemer. In the inscription on the pedestal, the author compares Cosmas to Hippocrates and Damian to Galenos. At present, the bridge is under the administration of the Charles Bridge Association of Artists, the sculptures are maintained by the Prague Gallery. 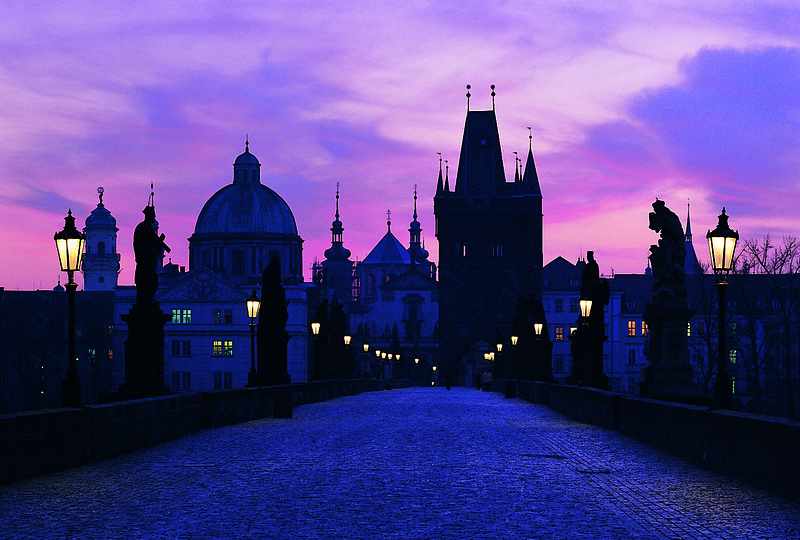 Charles Bridge is a National Cultural Monument.